I'm wondering what in the heck is Paris Hilton wearing? I know it was her b-day but I, for one, believe that whether you're going all out or just hanging out, you need to look FAB! This New Year's Eve look is sooooo 3 months ago. I think I'll piece together a look below for her because I do NOT want this to ever be duplicated. Not to mention, my eyes are a little blurry from having to look at it. Geesh! Talk about too much coordination. First, let's get rid of all her accessories and just start over with a clean slate. I'm not a fan of the dress either so I'm going to choose a silhouette that I think is more flattering on most females. Remember, you want the focus to be on the dress.....whoever is looking at you shouldn't feel like a camera just flashed them. Minimal accessories and understated coordination is the key. Look at the pic of Vanessa L. Williams below. Although her dress is not sequined, it does have the metallic look which can require strategic styling to tone it down. Vanessa has minimal accessories and her necklace, watch, and earrings compliment her dress without overpowering it. Her heels are open-toe, a better choice, and the clutch serves the look as it should......an accessory item only. See the below items for examples of this......more aptly styled sequined look I've gathered for all you divas. The chiffon waist helps to break up the monotony. I would highly suggest a peep-toe or an open-toe heel. Understated coordination is what you're looking for with either or these two choices. 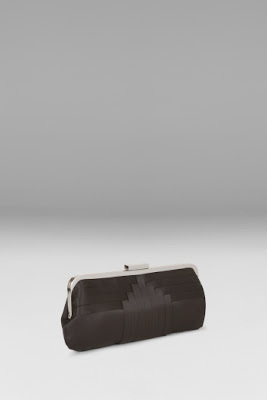 A simple, basic black clutch compliments everything superbly! The above earrings are also understated. They're elegant and chic as well.